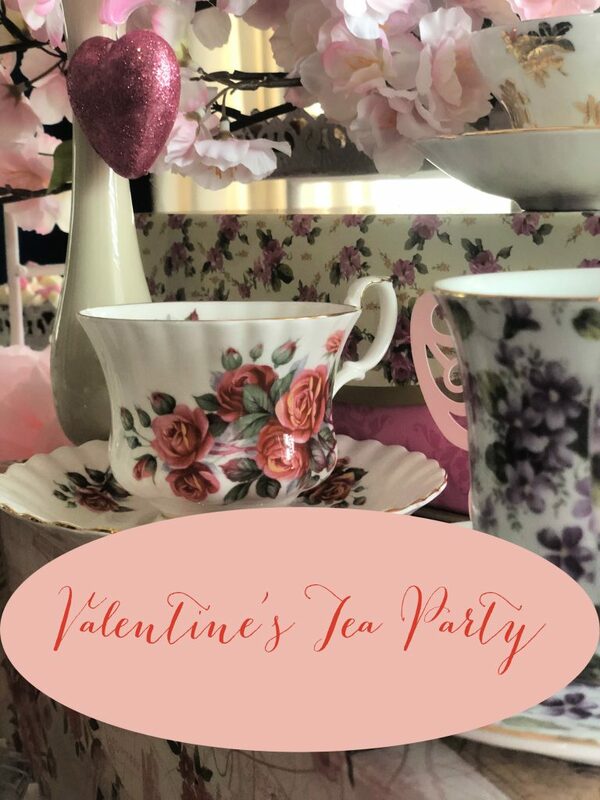 Valentine’s Day is not just for date night. 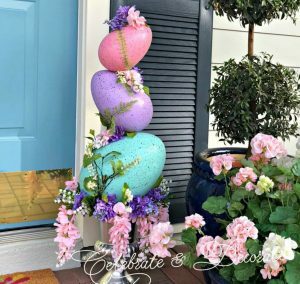 Pink silk wisteria tumbled down, hanging from the chandelier and accompanied by pink hearts dangling over the table. 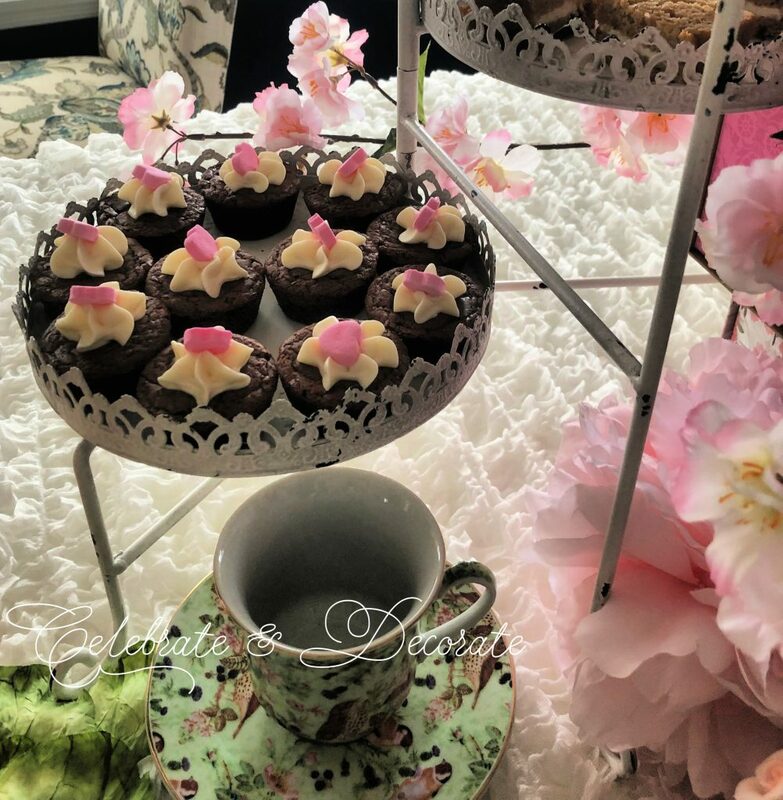 For me a tea party must include little tea sandwiches. For this occasion I used a banana walnut bread with maple cream cheese and traditional cucumber sandwiches. This creamer and sugar bowl were given to me by my mother. She bought them at an antique show and sale in the late 1960’s. 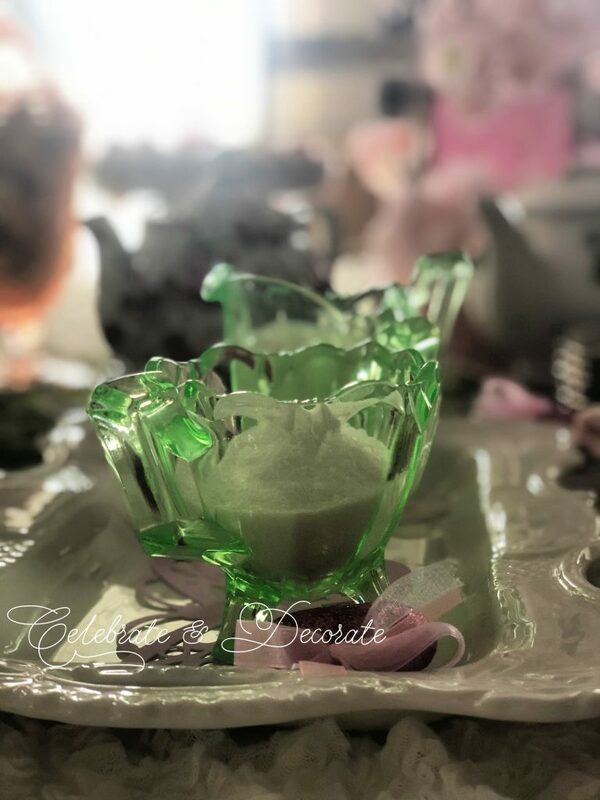 From my research, these are antique vintage green Vaseline Uranium pressed glass. 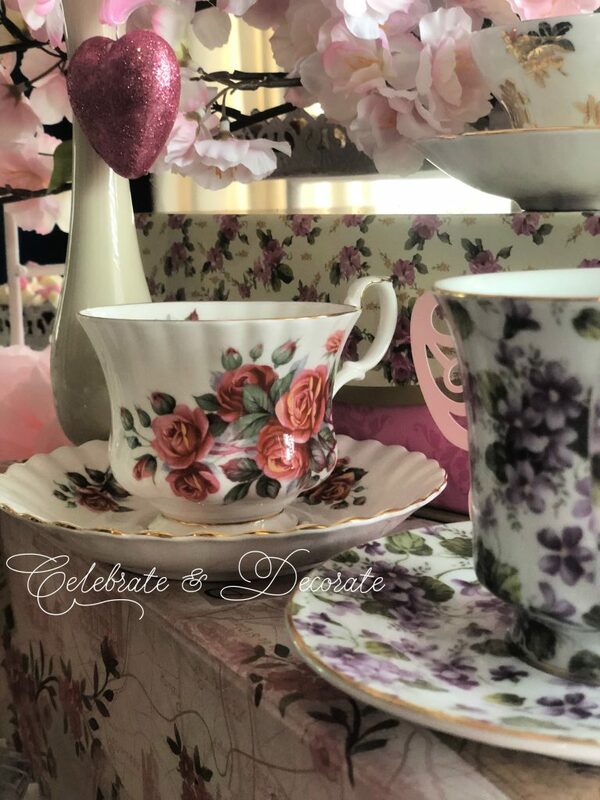 They are a lovely addition to any table, but particularly on this romantic Valentine’s tea party table. 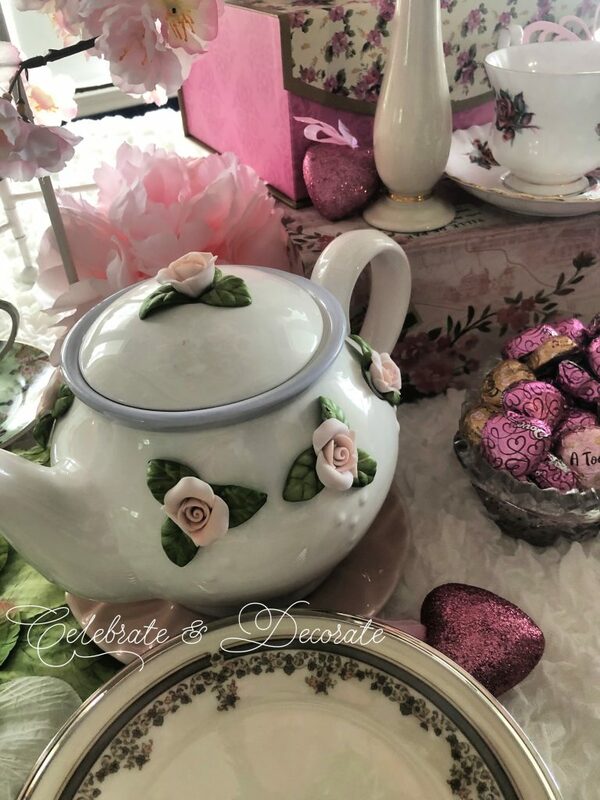 I didn’t even realize my pretty tea pot with porcelain roses had a chip in a rose until I took the time to edit these photos. These are so delicate, I am sure it bumped up against something in the cupboard. For guests to help themselves to sweets and tea sandwiches, I set out my dessert plates from my china collection. The pattern is Lace Point by Lennox. 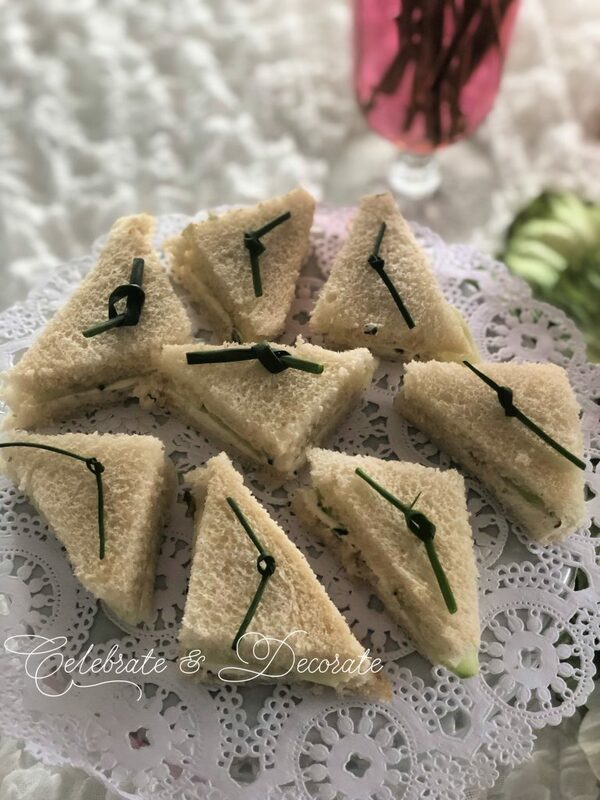 Traditional cucumber sandwiches are topped with fresh chive knots and served on paper dollies. I baked brownies in mini muffin tins and topped them with a dollop of frosting and of course, added a tiny pink conversation heart. 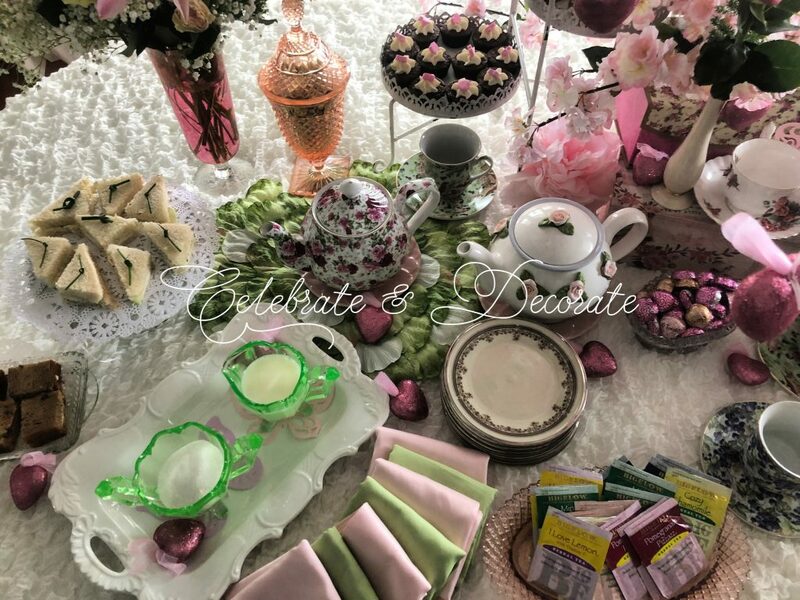 I set out a selection tea cups and saucers so that each guest can select their favorite. 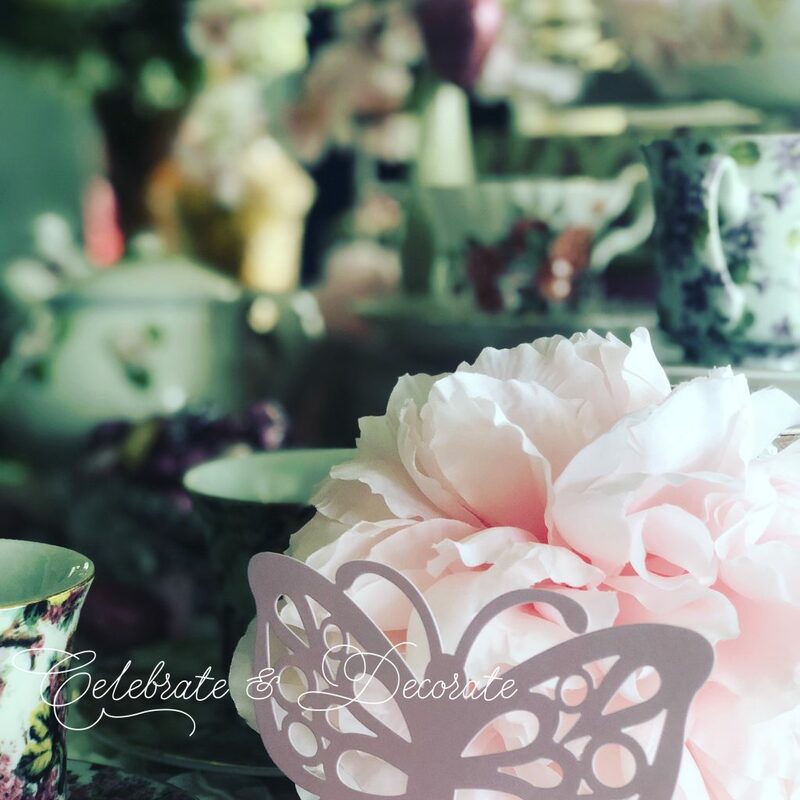 In addition to pink silk wisteria hanging from the chandelier, the table was decorated with pink floral puffs and paper cut out butterflies. 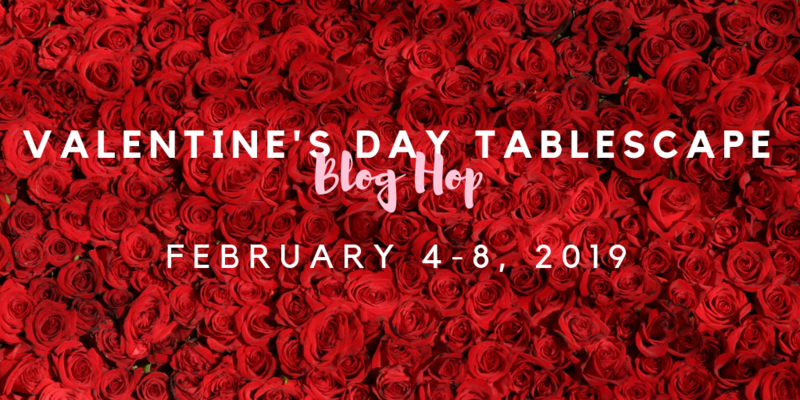 Come on by these fabulous blogs and check out their tablescapes this week! May you have a delightful Valentine’s Day. Thank you so very, very much! I hope you have a wonderful Valentine’s Day, too! Fantastic. Your are so creative and i always look at yours as soon as I see you’ve posted something new. Just lovely!! Oh thank you so much Joyce! 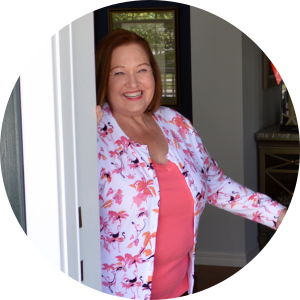 I LOVE hearing from my readers, and your comment is so sweet! 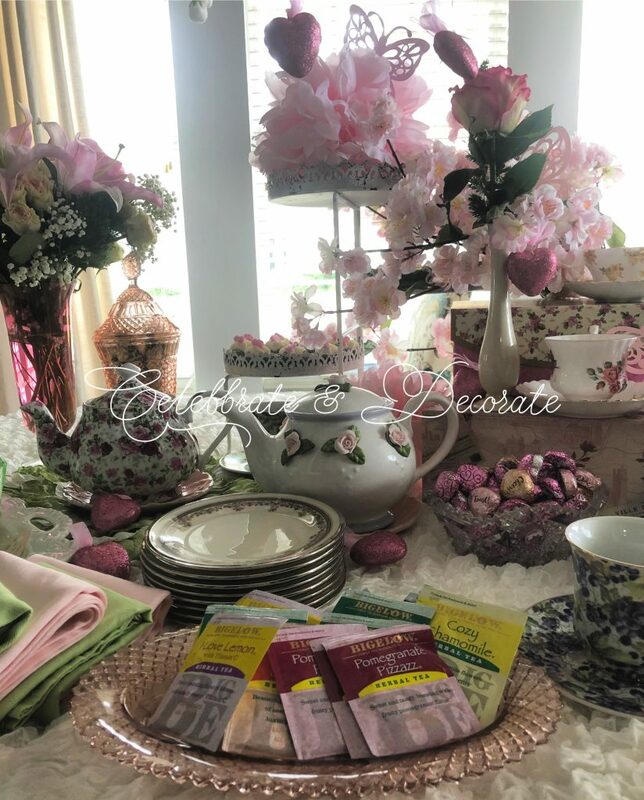 A beautiful tea party, Chloe! I would enjoy being a guest very much. Thank you so much Bonnie! 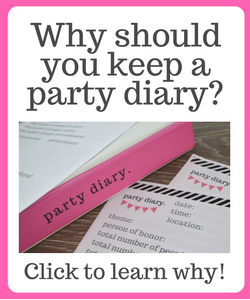 These are the kinds of parties I love styling and hosting! Thank you so much Debby! I am heading over to yours in a bit, I am still managing this IG post from a hotel on the road! Everything is so lovely and pretty. That vaseline glass is SO strikingly beautiful, Chloe! 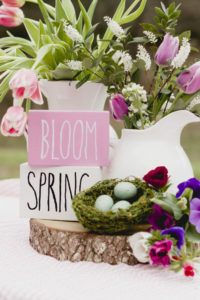 Love it against the pale pink, a la Dorothy Draper Greenbrier style! 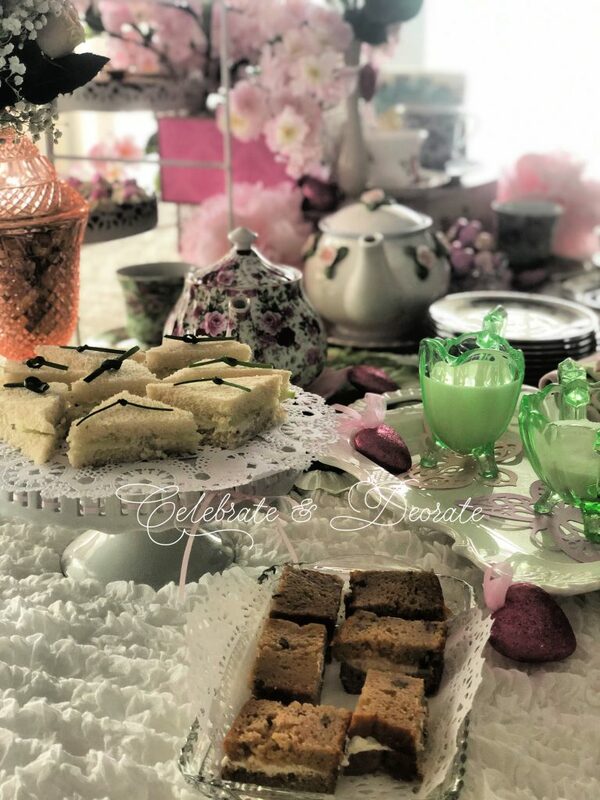 Any authentic tea party must include those little cucumber sandwiches, yes indeed, and your choice desserts look scrumptious! 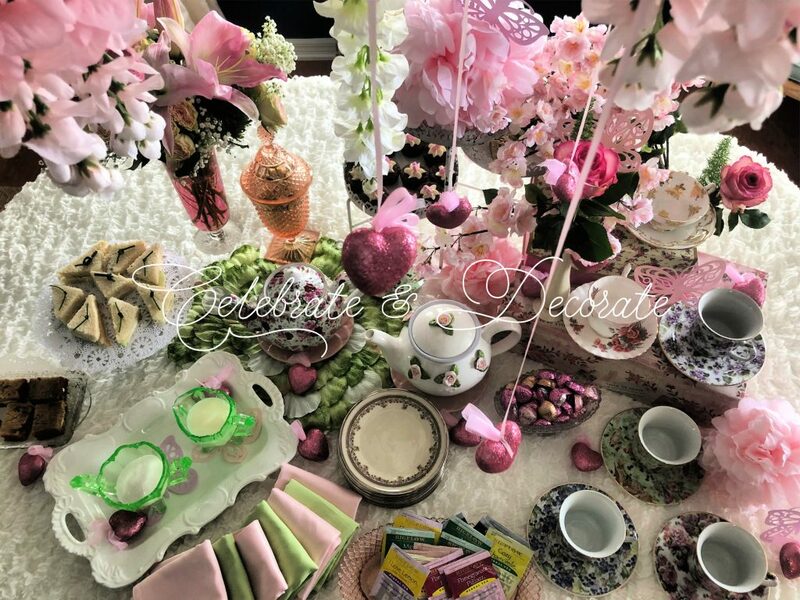 Who could resist a girly tea party full of delicious pretty nibbles! This is delightful Chloe! So pretty and I just love how girly it all is. Thanks so much for sharing with us at Share Some Love. Pinned. It’s so warm, inviting and totally inviting. I don’t remember the last time I invited my gal gathering and you’ve inspired me to host one soon.